It's that time of the week, where you can enjoy a bit of the midweek boot spots. This time round it is however a bittersweet symphony, as the end of this weeks games, signal the end of Champions League football until February. This has still not stopped us from spotting some goodies for you, that you can see right here. Karim Benzema (Real Madrid)  Adidas F50 Adizero MiAdidas Custom Gold/Black The Spanish Champions showed their, until now, dormant class, as they ripped Ajax Amsterdam apart, with a 4-1 win. The French superstar striker didn't get his name on the score-sheet, but as adequate compensation, we've given him a place in our boot spots. 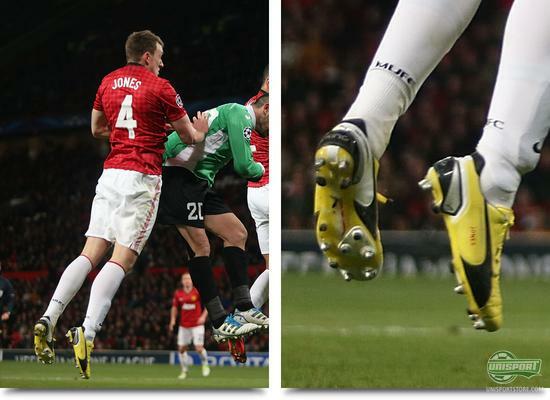 He has earlier, as one of the first, débuted the newest generation of Adidas F50 Adizero, but for Tuesdays game, he had gone back to his specially designed Adidas F50 Adizero in Gold/Black. Is it simply for aesthetical reasons, that Benzema stays in the old generation of Adizero? 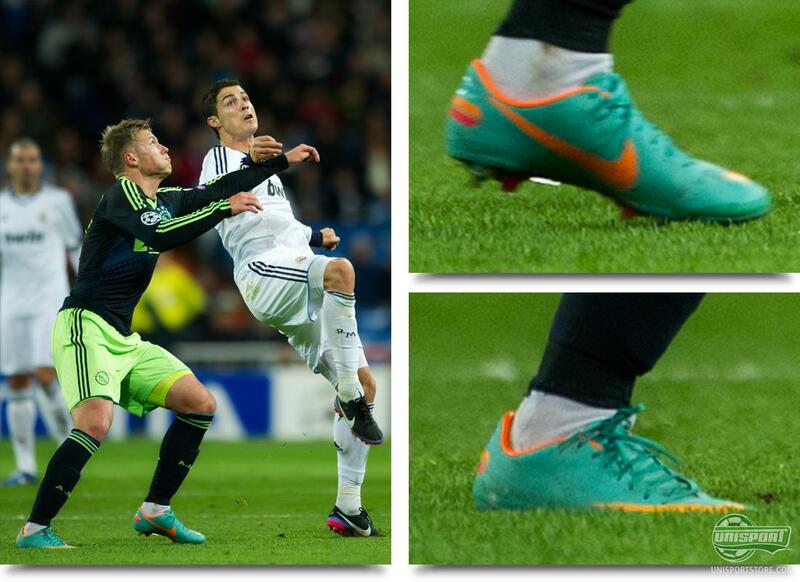 Viktor Fischer (Ajax)  Nike Mercurial Vapor VIII ACC Retro/Total Orange/Challenge Red In the same game, the Danish viewers got the opportunity to see their new hopes for the future and especially one of the young prodigies caught our attention. It was the striker Viktor Fischer, who was preferred at the Bernabeu and here he, in patches, showed his tremendous talent. He also showed off a new pair of boots. He did this even though he's been so successful in Adidas F50 Adizero, but it would point to the fact, that the teenager's signed with Nike, as he tried to face up to Ronaldo in a pair of Nike Mercurial Vapor VIII ACC Retro/Total Orange/Challenge Red. Jonas (Valencia)  Mizuno Morelia Neo Yellow/Blue There were several Spanish teams in play and in one of them, the goalscorer Jonas came in focus, when he scored from the penalty spot. 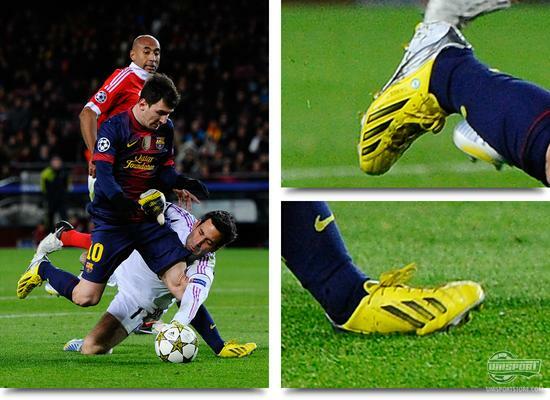 It was however his boots, that caught the attention of many of our users, so naturally we took a closer look. Jonas has been a frontrunner for the Mizuno Supersonic Wave control boot, but in this Wednesdays Champions League clash with Lille he'd preferred a pair of Mizuno Morelia Neo, who are normally championed by the Brazilian Hulk. The kangaroo leather boot weighs just 170 grams and is a very popular choice among the professionals  what do you think? Lionel Messi (Barcelona)  Adidas F50 Adizero Yellow/Black The Argentinian wizard was before the seemingly indifferent evening game, cruising to equalling Gerd Müllers legendary goal scoring record, as he was just 1 goal of the magic 85. Record or not, Messi however started on the bench for Barcelona, but when he entered the fray in the second half, it was clear to see, that he had just one thing in mind; hit the back of the net. Unfortunately, his record attempt was jeopardised in dramatic fashion, as a rare misplaced touch took the ball a little too close to the goalkeeper, who stormed out into Barcelona's number 10. Afterwards he and his Adidas F50 Adizero Yellow/Black had to be stretchered off the pitch, luckily all the information on the injury points to it only being a bruised knee, and he'll be back in time to give his record another go. 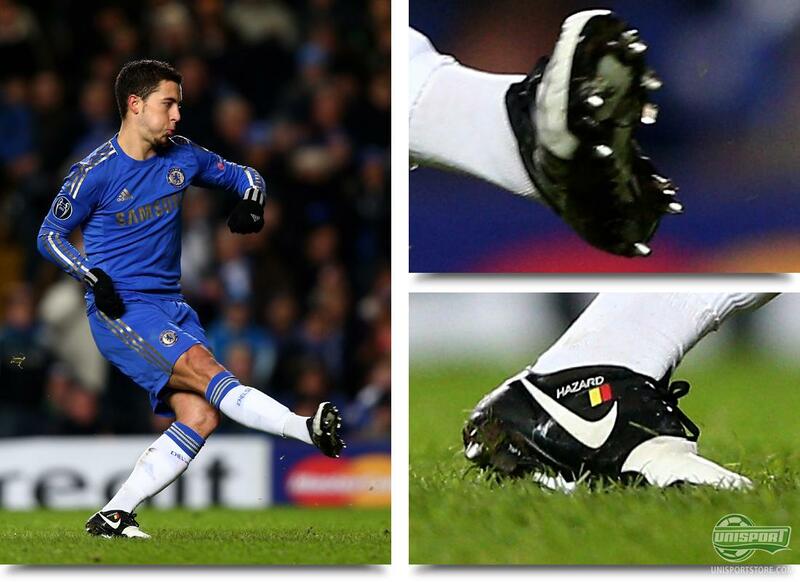 Eden Hazard (Chelsea)  Nike GS2 ACC White/Black The Danish outfit where looking to avoid crashing out of the Champions League, without a single victory, unfortunately for FC Nordsjælland, a trip to Stamford Bridge wasn't about to change that. Eden Hazard wasted the chance to add to the Nike GS2 ACC White/Black goal tally in a game, that would otherwise invite to that, when his penalty was picked out by FCN's Jesper Hansen. We can also note, that Eden Hazard has taken advantage of the perks of being a professional, as his Nike GS2 have been equipped with a mixed SG stud-configuration, rather than the standard FG. Henrik Kildentoft (FC Nordsjælland)  Pelé Sports Trinity 3E SL Black/Neon It was injury galore for the defenders from the The Danish club, who were already missing their young star centreback Jores Okore. Early on in the game, Ivan Runje had to be carried off the pitch, which paved the way for Kildentoft to make an appearance. He was responsible for a rare visitor in our boot spots; the top cool Pelé Sports Trinity 3E SL Black/Neon, that our reviewer, Jakob, gave tremendous praise. If you look closer you can also make out, that he's had a special SG stud-configuration put on to compensate for the wet conditions. Phil Jones (Manchester United)  Puma King Yellow/Black The talented Englishman was once again back in the United starting line up and this was just the third time this season, after being sidelined with an injury. Before his lengthy lay off he'd been playing in a pair of Puma Powercat 1.12, but had also before showed off both Puma King's and Puma King SL's. When the latest generation landed recently, the good Phil looks to have been fast to make the switch, and we will most certainly, be seeing the cliff of a man in the iconic King's for the foreseeable future. Bastian Schweinsteiger (Bayern Munich)  Adidas Adipure 11Pro White/Blue/Black and White/Red/Black It can be hard to believe, but none the less true. Bayern Munich's captain and proud holder of the title as: "the worlds most fickle boot picker", tried a new pair in the midweek game against Bate Borisov. In the first half he displayed his massive skill-set in the Adidas Adipure 11Pro White/Blue/Black, that are actually just a pair of Adipure III in disguise, but in the second half, he changed to the new colourway White/Red/Black. This would indicate, that Adidas have either made a new Adipure III custom for Schweinsteiger, or maybe he's finally gotten comfortable in a pair of regular Adipure 11Pro. Mario Gomez (Bayern Munich)  Puma Evospeed 1 White/Silver Hey wait, what's this!? The German target man is known as a big supporter of Puma's Speedsilo and has, since his return from injury, been playing in the launch colour of the Puma Evospeed 1 White/Blue/Red, but against Bate Borisov, it was something entirely new we found. It was a pair of Puma Evospeed 1 White/Silver and either Mario Gomez has had them made personally, or maybe he's just débutted a brand new colourway too soon, only time will tell. Eros Pisano (Palermo)  Nike Tiempo Legend IV Blue/White Blackout We have a special place in our heart reserved for blackoutted boots and when we scanned the pictures from Palermo's training, we where more than a little enthused when we found these. A pair of Nike Tiempo Legend, that Eros Pisano had blackoutted himself, but he has left the iconic Nike-swoosh to give the boot a really unique and exceptional look. - Have you ever blackoutted your own boots? This is all from this rounds Champions League games and with the completion of the Europa League games too, it's the end of European club football until February. What do you think of this weeks spots? Which was the best? What are your thoughts on Gomez' new Evospeed 1? 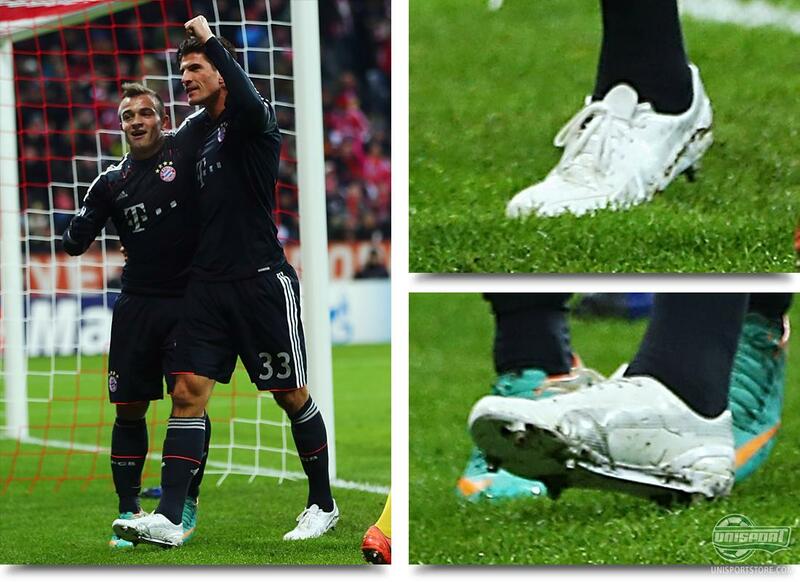 And do you think, that Schweinsteiger's finally settled for Adipure 11Pro? Share your thoughts and comments in the box down below.